Wherever the first inhabitants of the world gathered together, they engaged in the human concerns of community building, interpersonal relations, and spiritual understanding. As such these earliest people became our “first psychologists.” Their wisdom lives on through the teachings of contemporary Indigenous elders and healers, offering unique insights and practices to help us revision the self-limiting approaches of modern psychology and enhance the processes of healing and social justice. Reconnecting psychology to its ancient roots, Richard Katz, Ph.D., sensitively shares the healing wisdom of Indigenous peoples he has worked with, including the Ju/’hoansi of the Kalahari Desert, Fijians native to the Fiji Islands, Lakota people of the Rosebud Reservation, and Cree and Anishnabe First Nations people from Saskatchewan. Through stories about the profoundly spiritual ceremonies and everyday practices he engaged in, he seeks to fulfill the responsibility he was given: build a foundation of reciprocity so Indigenous teachings can create a path toward healing psychology. Also drawing on his experience as a Harvard-trained psychologist, the author reveals how modern psychological approaches focus too heavily on labels and categories and fail to recognize the benefits of enhanced states of consciousness. 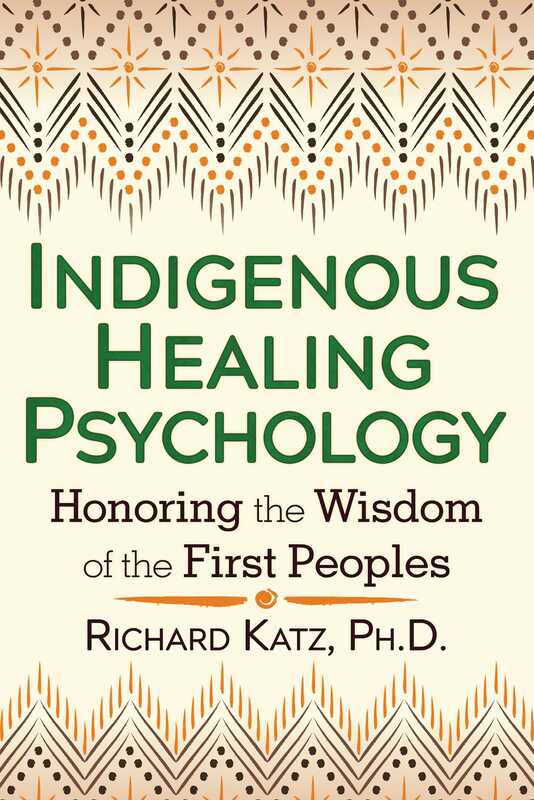 Exploring the vital role of spirituality in the practice of psychology, Katz explains how the Indigenous approach offers a way to understand challenges and opportunities, from inside lived truths, and treat mental illness at its source. Acknowledging the diversity of Indigenous approaches, he shows how Indigenous perspectives can help create a more effective model of best practices in psychology as well as guide us to a more holistic existence where we can once again assume full responsibility in the creation of our lives. Part of Danny’s responsibilities is to learn and know the many songs that activate and accompany the ceremonies. The songs are calls and pleas to the spirits, asking for the blessing and protection Part of Danny’s responsibilities is to learn and know the many songs that activate and accompany the ceremonies. The songs are calls and pleas to the spirits, asking for the blessing and protection of the spirit world. They sing a sacred language. There is a song that Danny realizes he needs to learn in order to more completely fulfill his responsibilities, and he knows the Anishnabeq elder who knows that song. Thus begins his research effort. He approaches the elder with respect, because the elder is a man of knowledge. The elder also has sacred responsibilities, one of which is to protect and nurture his songs, and offer them to others when appropriate. Danny will be requesting an opportunity to learn a song that the elder is holding dear to his heart. The elder is grateful Danny has come, because it’s the elder’s responsibility to pass on his knowledge to deserving others; his knowledge lives only as it is shared with others. The elder sings his song, and Danny listens. He draws upon his lifetime of training, to listen with care, being open to all realms of sound and meaning, so he can hear--and remember. This ability to hear is sharpened as it becomes infused with spiritual energy. Danny smiles, and then he and the elder enjoy a good laugh. “Of course,” Danny realizes to himself, “of course.” Danny now prepares at another level to listen, so he can hear, really hear and thereby learn. Being more relaxed through the laughter, his ears open to his mind and heart, and listening a few more times he connects to the spiritual sources of the song. As Danny embarks on this piece of Indigenous research he is seeking understanding not the prediction or control that earmarks the mainstream research approach. He knows that he must approach the goal of learning this new song by engaging his ways of knowing, and in the end bringing those ways to a deeper, more spiritually charged level. The entire process of working with the elder is a sacred journey, rather than the more technical, even mechanical character of the mainstream laboratory approach. Danny and the elder are co-creating the setting in which the learning and spiritual transmission will occur. This is not the unilateral possession of power and control in the hands of the laboratory researcher, but a co-created process of research and learning which either party can change. The elder is not a “subject,” but a person of respect, and even if Danny wanted to, he cannot become a mainstream researcher because he cannot subject the elder to anything. There are two experts involved, and involved with each other. As the research unfolds, it becomes effective because both become expert in both learning and teaching.